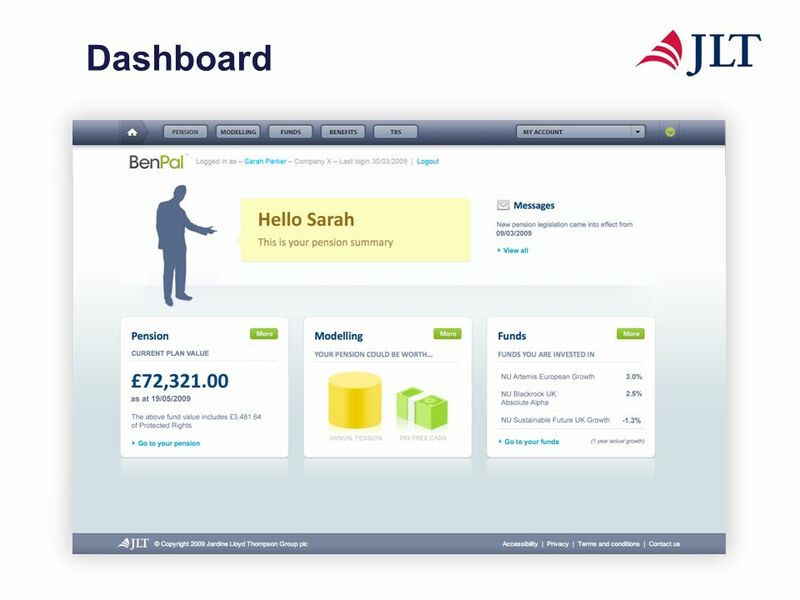 67 Providing a real alternative to clients. 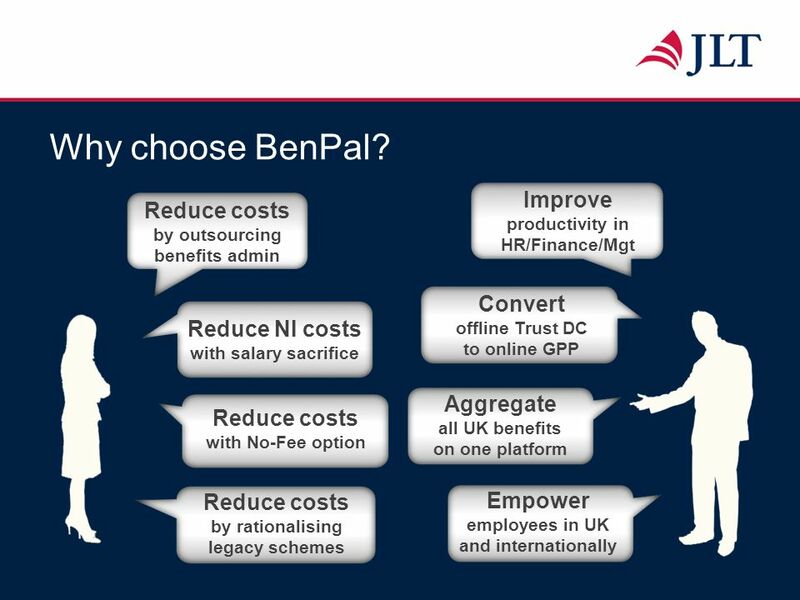 Today JLT Re & JLT Aerospace Providing a real alternative to clients. 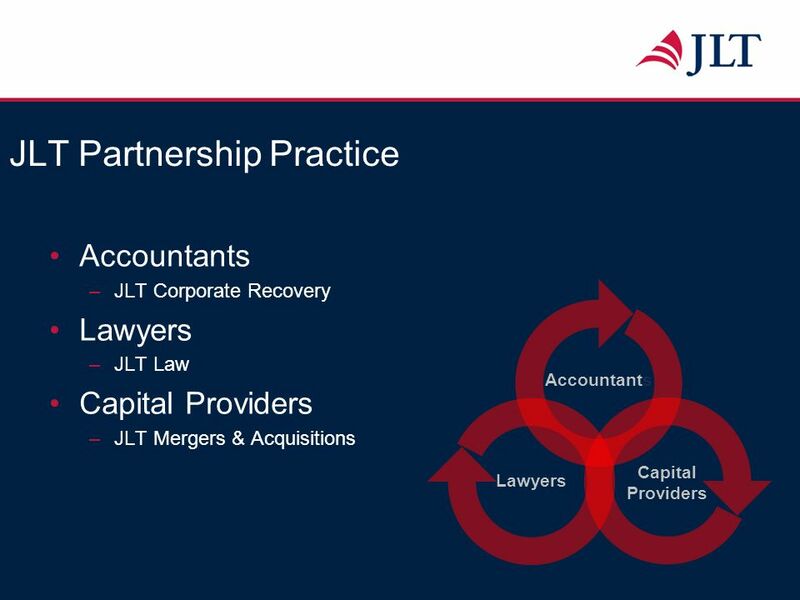 69 What is Lloyd & Partners? 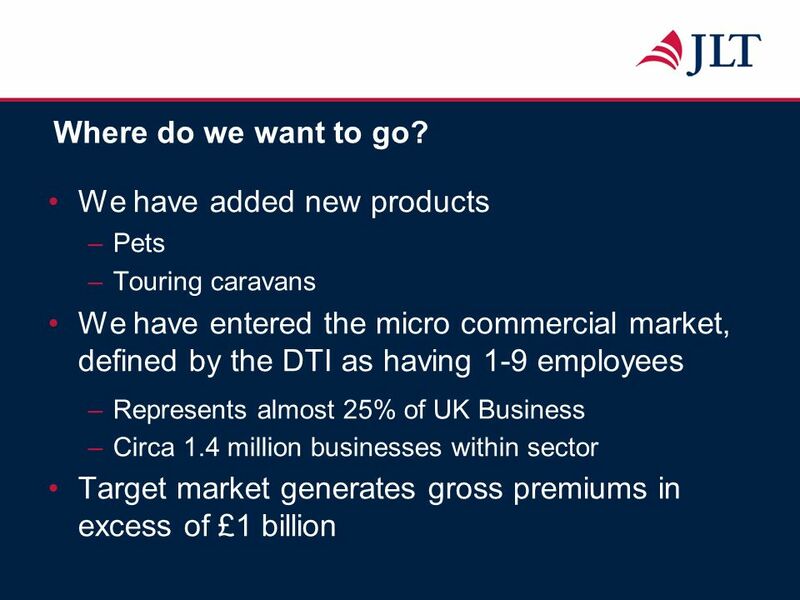 Revenue: £41.2 million	Revenue: £47.1 million Trading Margin: 17%	Trading Margin: 17% Goal is continued double digit top line growth and improved trading margin. 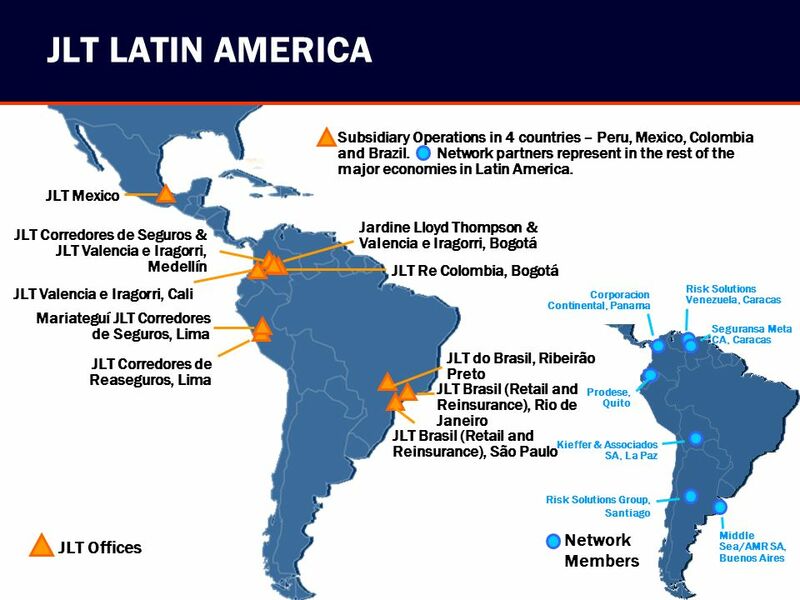 100 What is JLT Latin America? 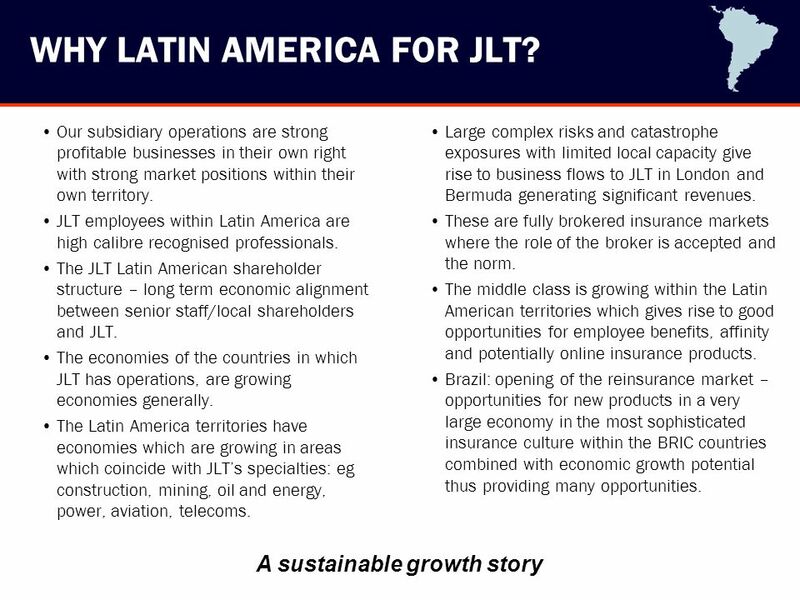 Why is Latin America important to JLT? 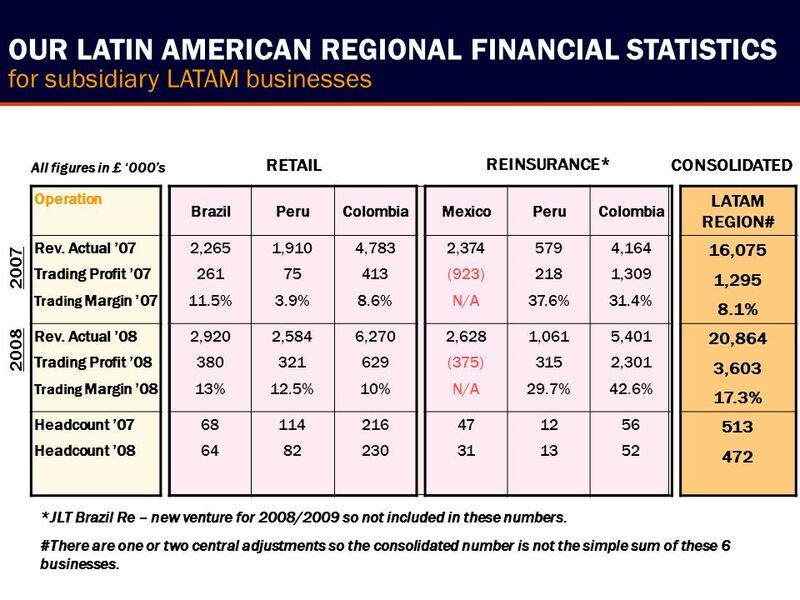 for subsidiary LATAM businesses RETAIL REINSURANCE* CONSOLIDATED All figures in £ ‘000’s Operation Brazil Peru Colombia Mexico LATAM REGION# Rev. Actual ’07 Trading Profit ’07 Trading Margin ’07 2,265 261 11.5% 1,910 75 3.9% 4,783 413 8.6% 2,374 (923) N/A 579 218 37.6% 4,164 1,309 31.4% 16,075 1,295 8.1% Rev. Actual ’08 Trading Profit ’08 Trading Margin ’08 2,920 380 13% 2,584 321 12.5% 6,270 629 10% 2,628 (375) 1,061 315 29.7% 5,401 2,301 42.6% 20,864 3,603 17.3% Headcount ’07 Headcount ’08 68 64 114 82 216 230 47 31 12 13 56 52 513 472 2007 2008 *JLT Brazil Re – new venture for 2008/2009 so not included in these numbers. 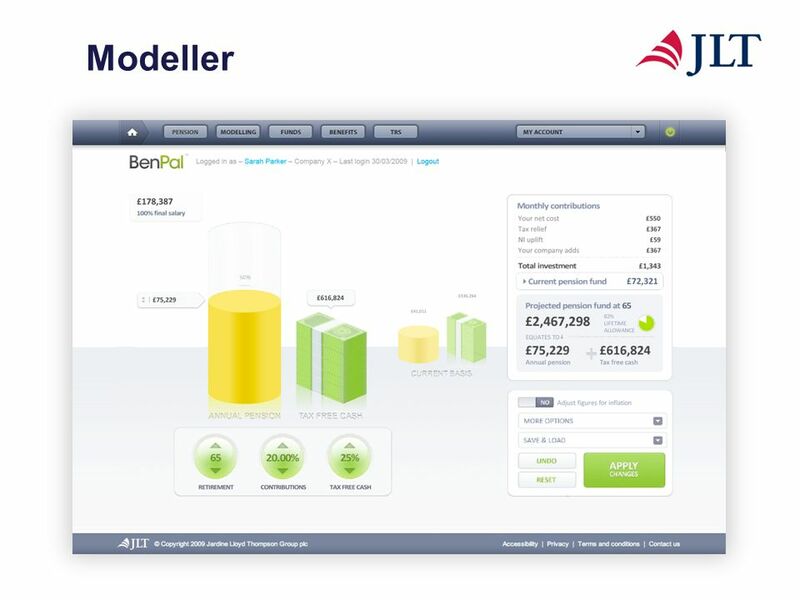 #There are one or two central adjustments so the consolidated number is not the simple sum of these 6 businesses. 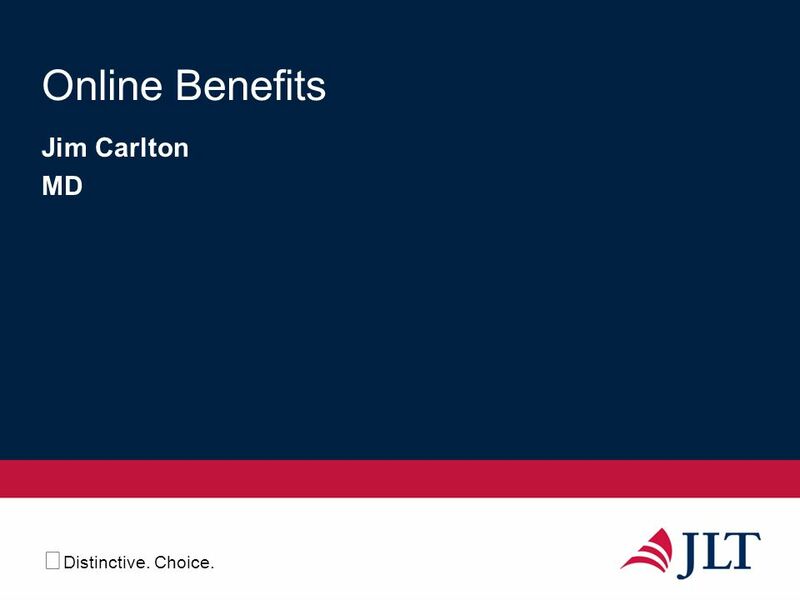 106 JLT MEXICO JLT Position: A facultative reinsurance broker only focusing on complex risk with international placement requirements. 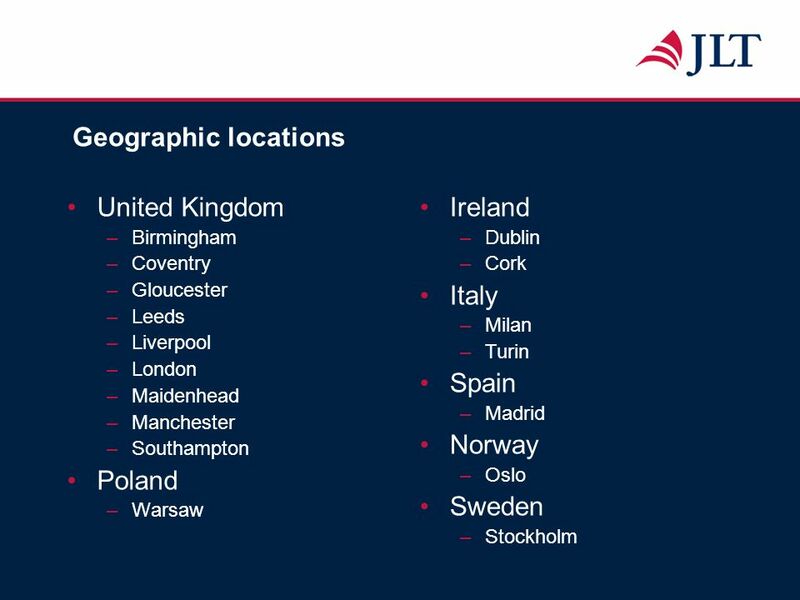 JLT Focus Areas: Aviation, Construction, Power & Industrial, complex risk. 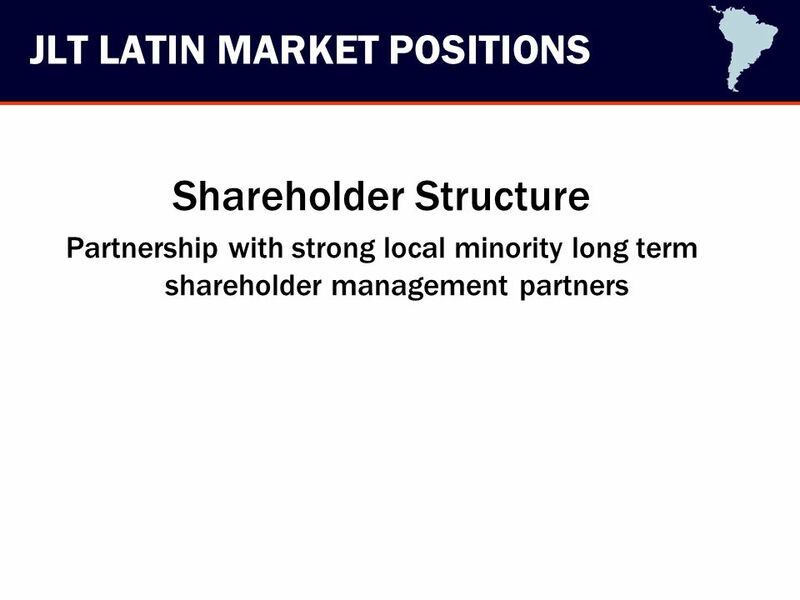 Market Position: 6th or 7th largest in revenue terms. All figures in £ ‘000’s REINSURANCE Operation Rev. 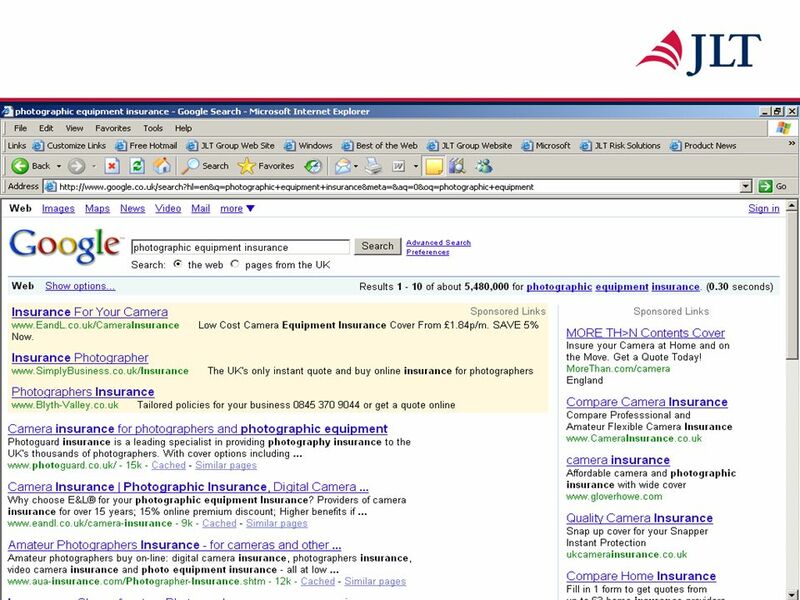 Actual ’07 Trading Profit ’07 Trading Margin ’07 Rev. 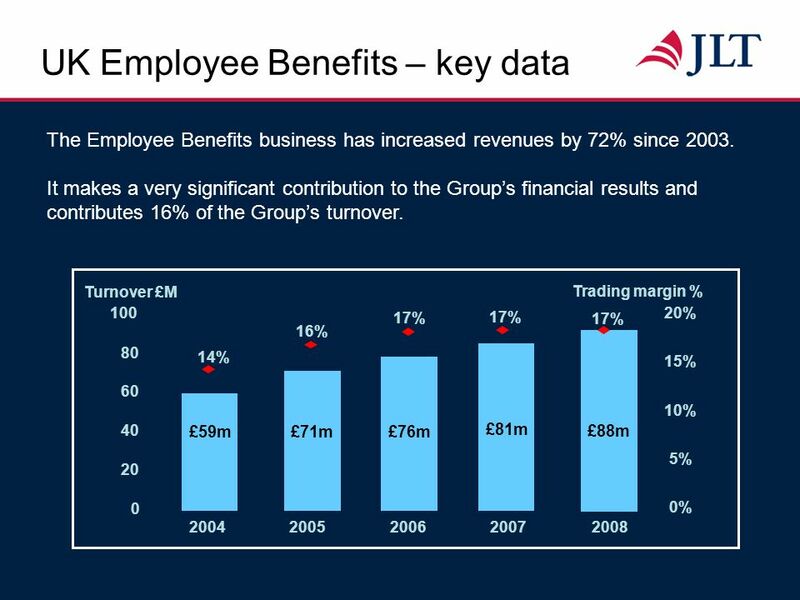 Actual ’08 Trading Profit ’08 Trading Margin ’08 Headcount ’07 Headcount ’08 Mexico 2,374 (923) N/A 2,628 (375) (N/A) 47 31 Turn Around: Lost much major business in 2006/2007, rebuilding, good growth forecast for 2009 and a return to profitability. 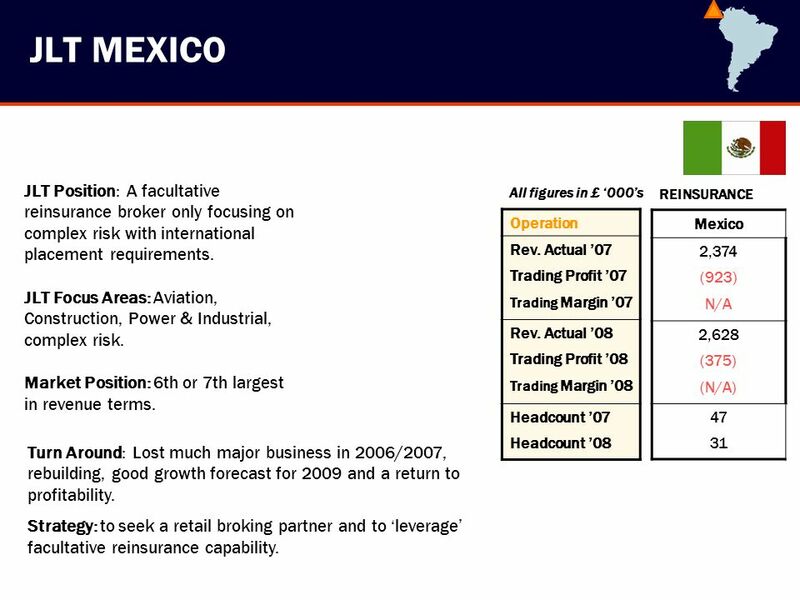 Strategy: to seek a retail broking partner and to ‘leverage’ facultative reinsurance capability. 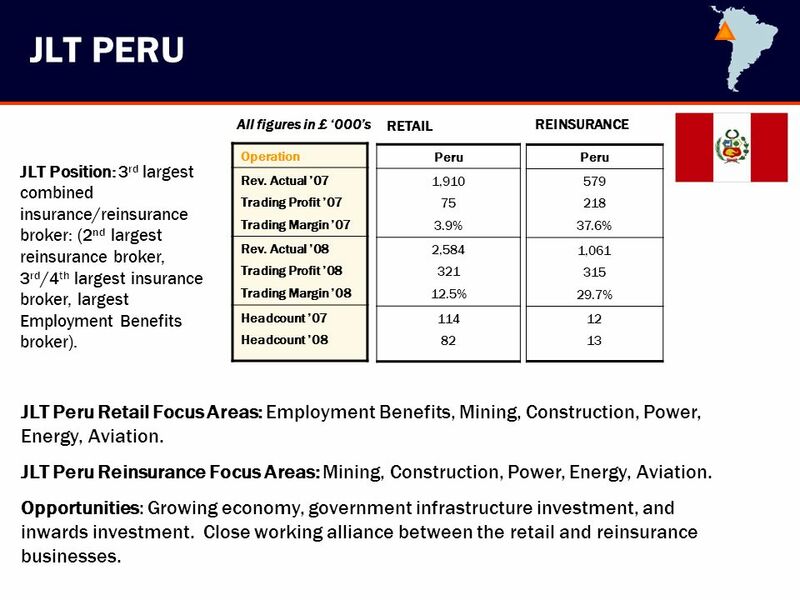 107 JLT PERU All figures in £ ‘000’s RETAIL REINSURANCE Operation Rev. 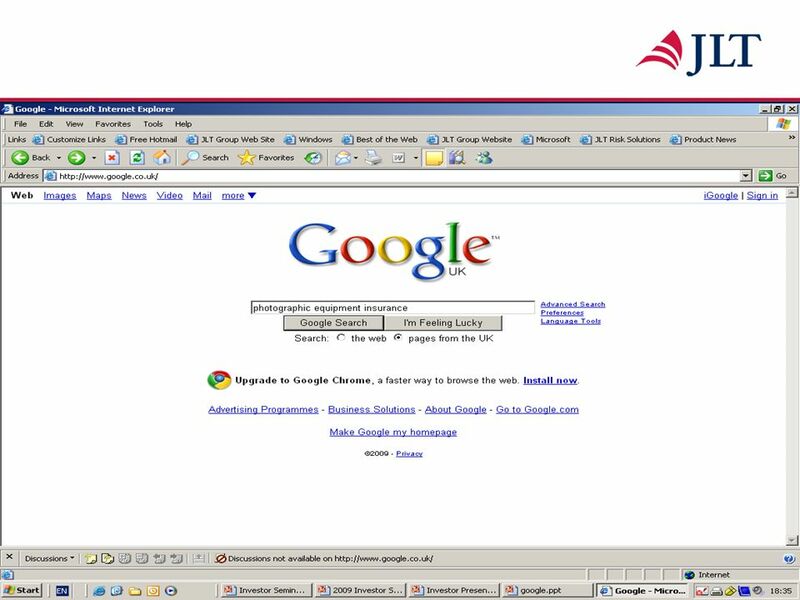 Actual ’07 Trading Profit ’07 Trading Margin ’07 Rev. 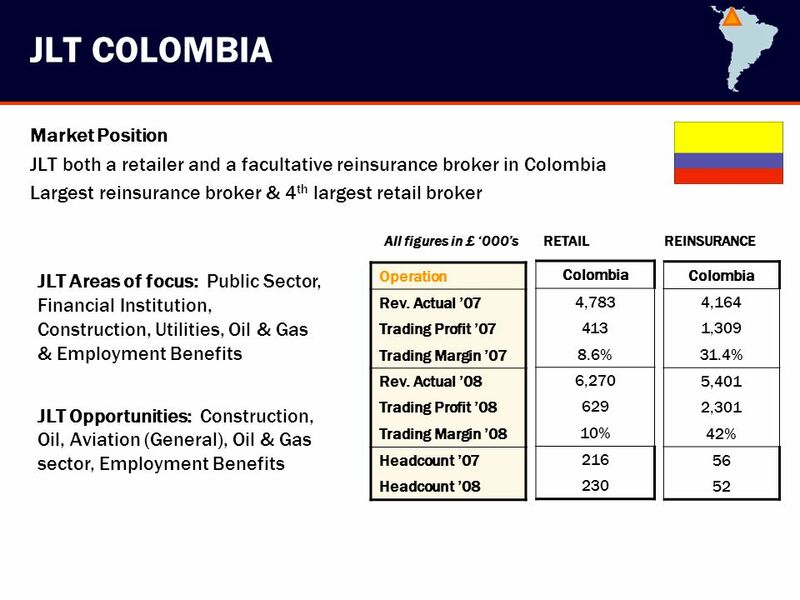 Actual ’08 Trading Profit ’08 Trading Margin ’08 Headcount ’07 Headcount ’08 Peru 1,910 75 3.9% 2,584 321 12.5% 114 82 Peru 579 218 37.6% 1,061 315 29.7% 12 13 JLT Position: 3rd largest combined insurance/reinsurance broker: (2nd largest reinsurance broker, 3rd/4th largest insurance broker, largest Employment Benefits broker). 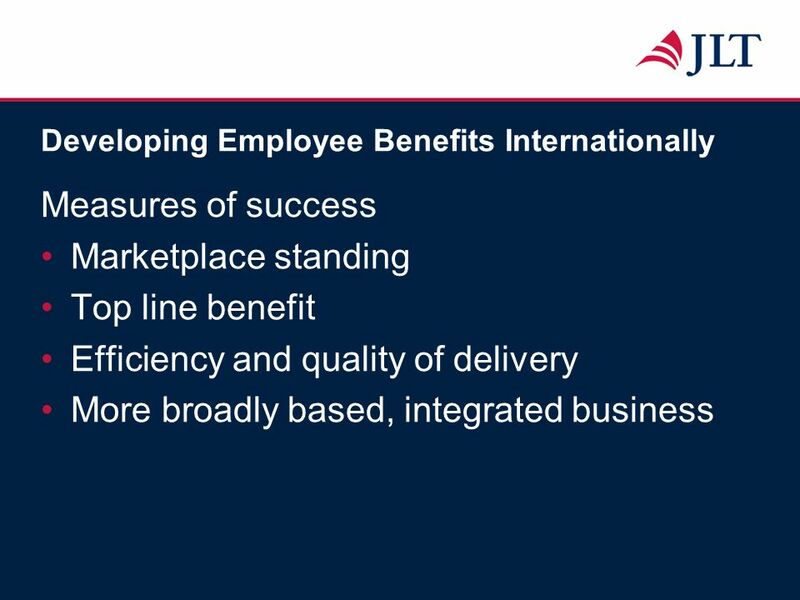 JLT Peru Retail Focus Areas: Employment Benefits, Mining, Construction, Power, Energy, Aviation. 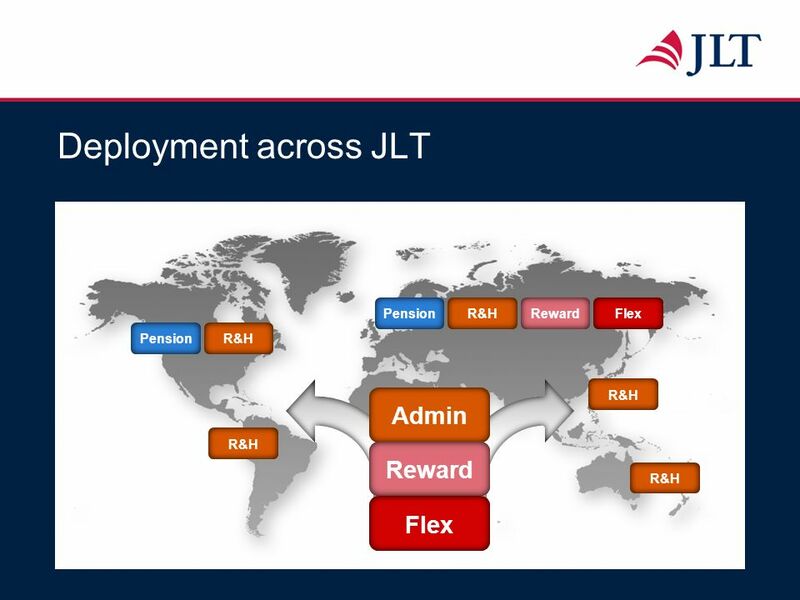 JLT Peru Reinsurance Focus Areas: Mining, Construction, Power, Energy, Aviation. 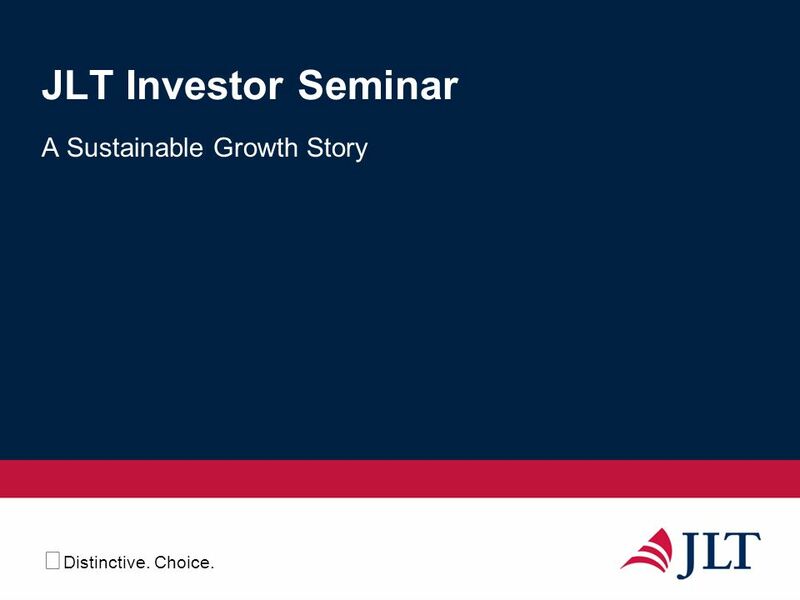 Opportunities: Growing economy, government infrastructure investment, and inwards investment. 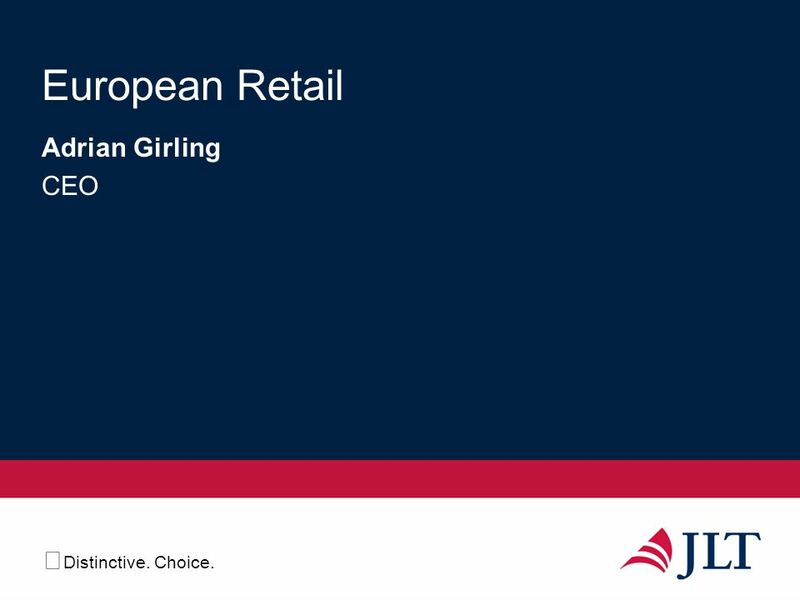 Close working alliance between the retail and reinsurance businesses. 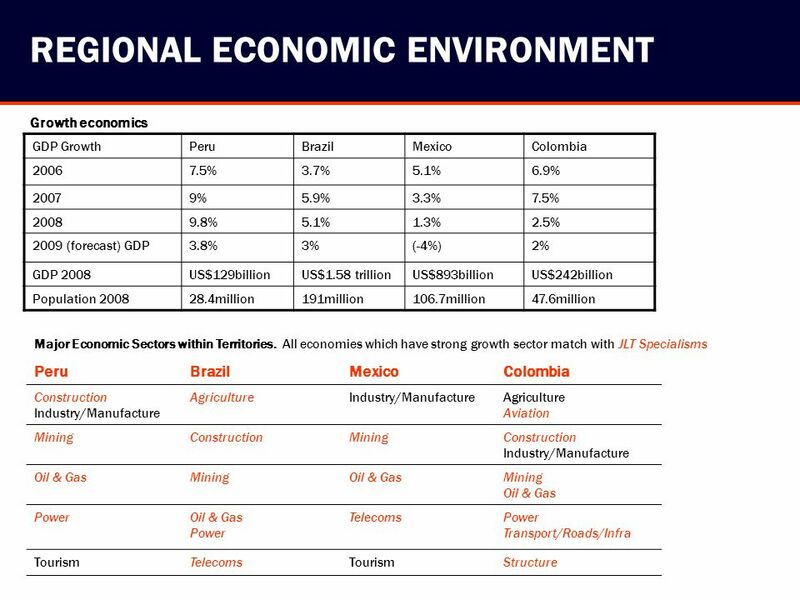 Largest economy of South America: 191 million people: GDP US$1.58 trillion Growing foreign investment: US$18 billion 2006; US$33 billion 2007; US$45 billion 2008. 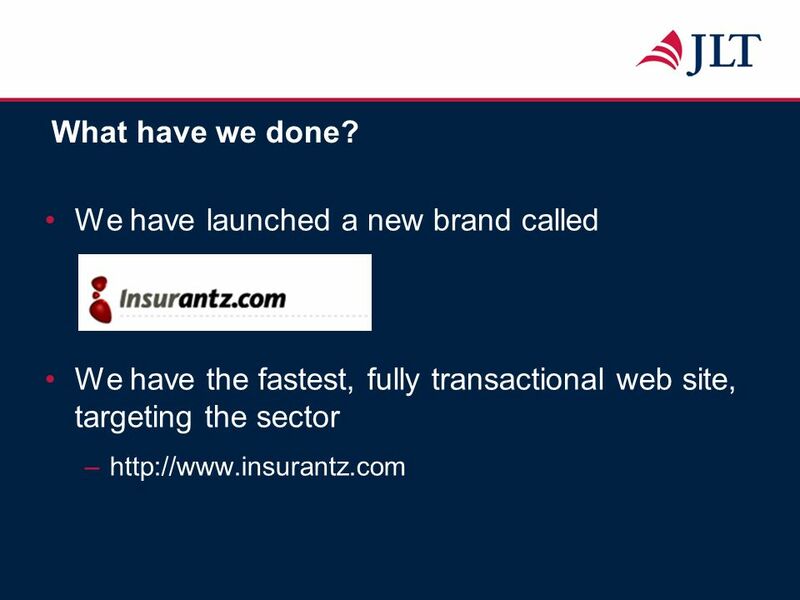 Opening of the reinsurance market, previous monopoly on reinsurance placements of IRB dismantled. 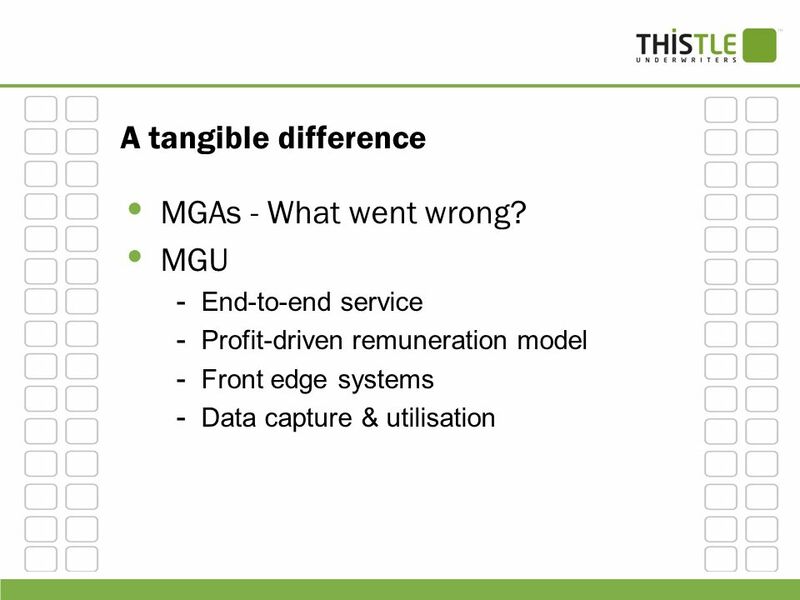 Local admitted reinsurer ‘monopoly’ reduced to 60% in 2008, 40% in 2011 and 0% in 2012. Operation Rev. 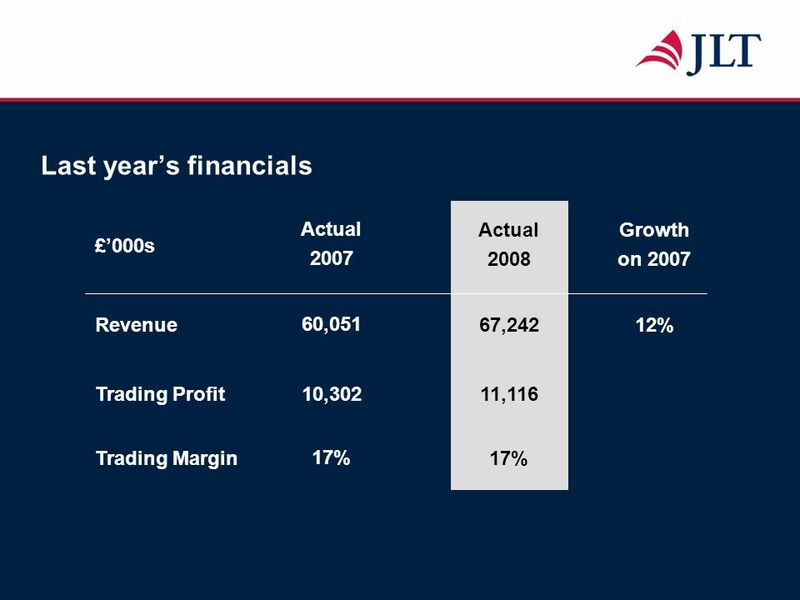 Actual ’07 Trading Profit ’07 Trading Margin ’07 Rev. 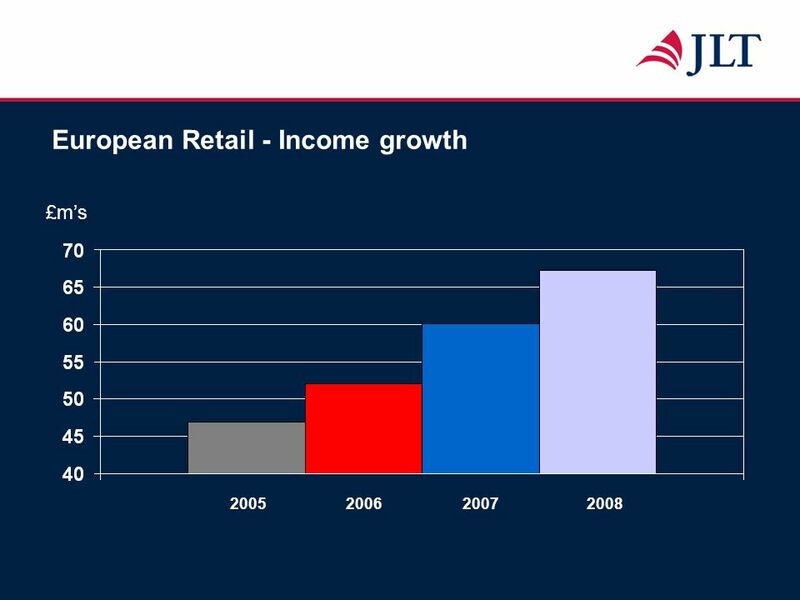 Actual ’08 Trading Profit ’08 Trading Margin ’08 Headcount ’07 Headcount ’08 Brazil 2,265 261 11.5% 2,920 380 13% 68 64 JLT Brazil Retail Established for 20 years. 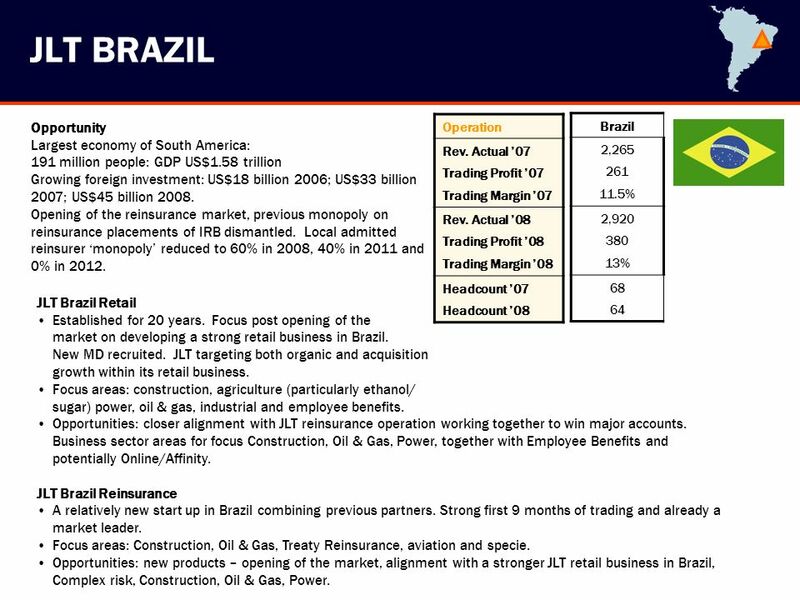 Focus post opening of the market on developing a strong retail business in Brazil. New MD recruited. 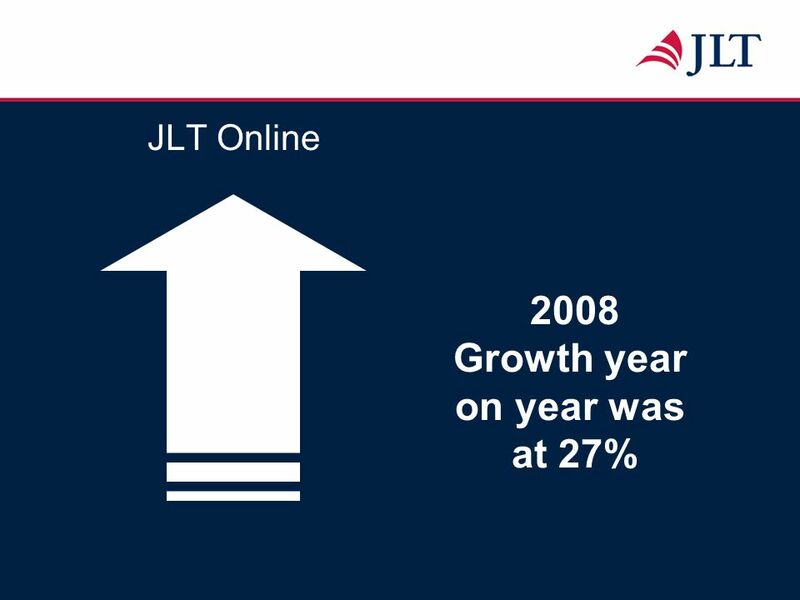 JLT targeting both organic and acquisition growth within its retail business. 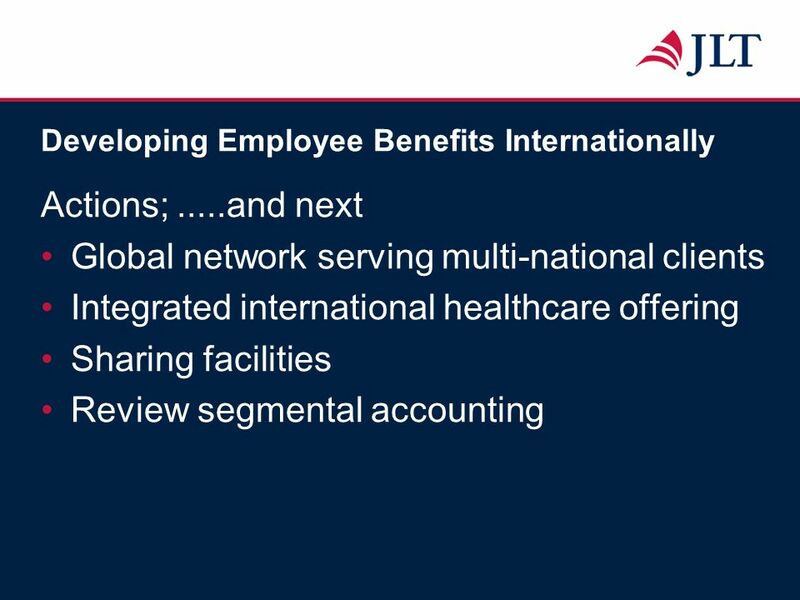 Focus areas: construction, agriculture (particularly ethanol/ sugar) power, oil & gas, industrial and employee benefits. 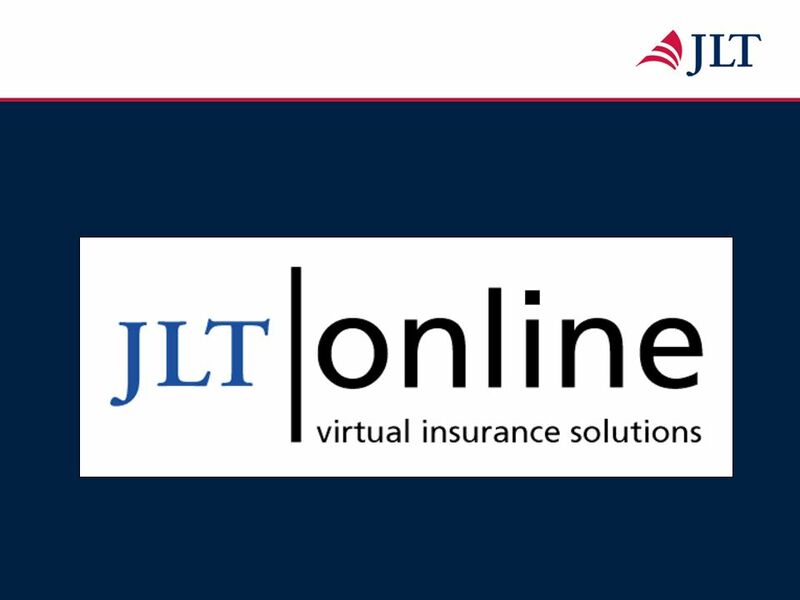 Opportunities: closer alignment with JLT reinsurance operation working together to win major accounts. 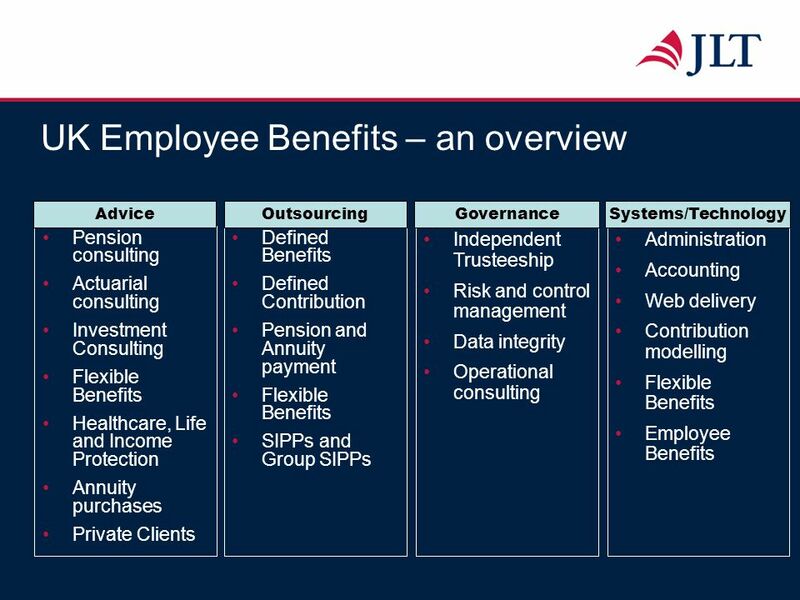 Business sector areas for focus Construction, Oil & Gas, Power, together with Employee Benefits and potentially Online/Affinity. 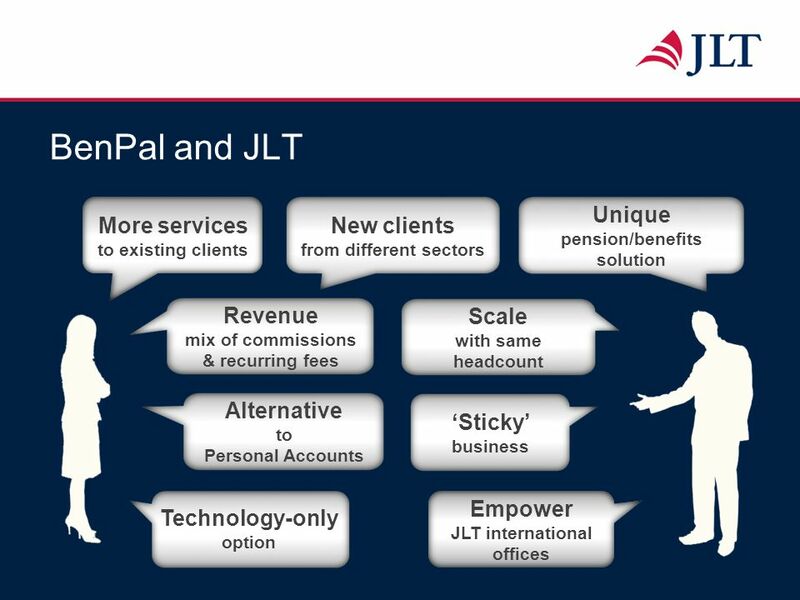 JLT Brazil Reinsurance A relatively new start up in Brazil combining previous partners. 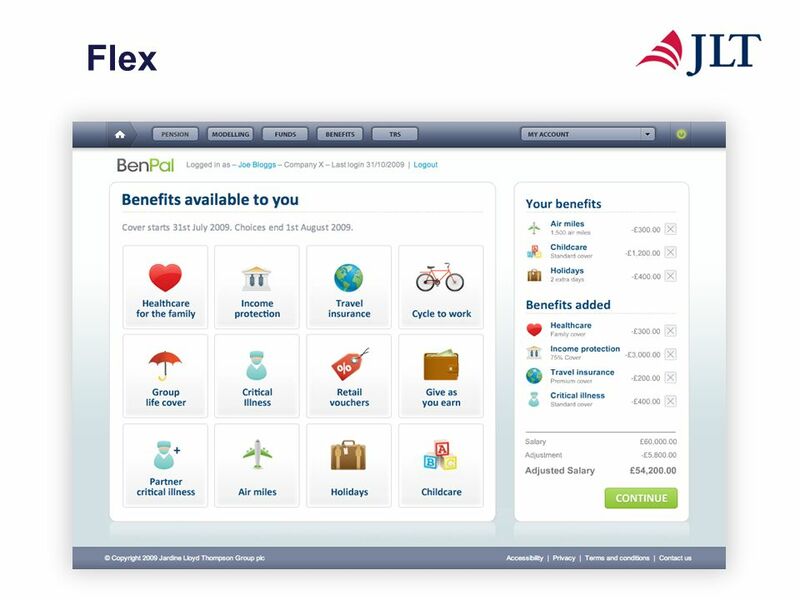 Strong first 9 months of trading and already a market leader. 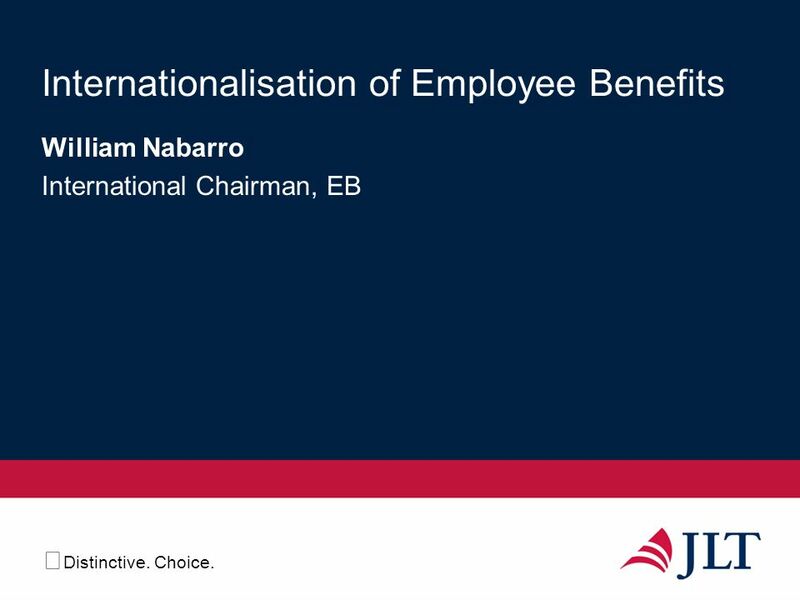 Focus areas: Construction, Oil & Gas, Treaty Reinsurance, aviation and specie. 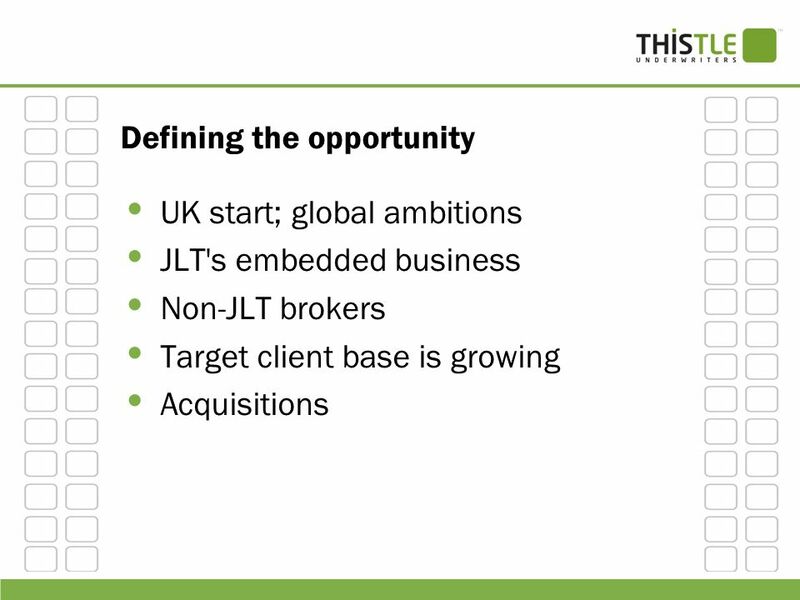 Opportunities: new products – opening of the market, alignment with a stronger JLT retail business in Brazil, Complex risk, Construction, Oil & Gas, Power. 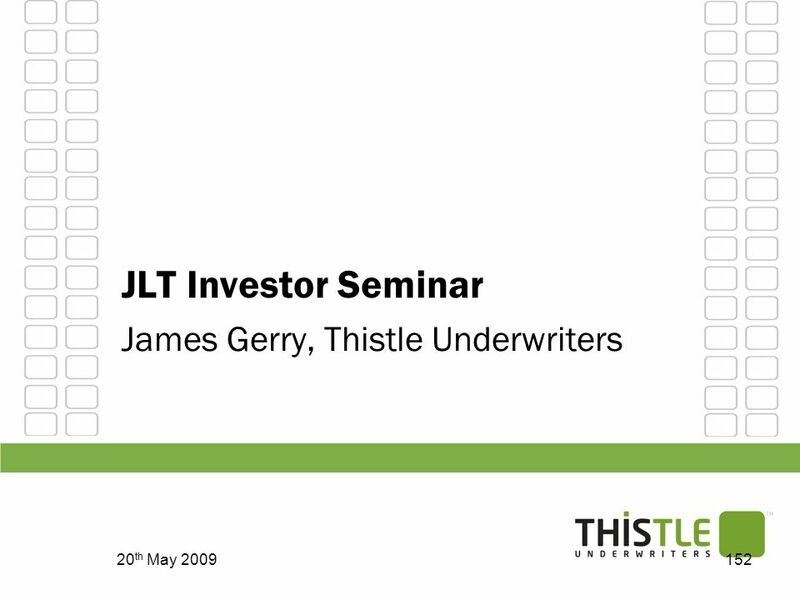 109 WHY LATIN AMERICA FOR JLT? 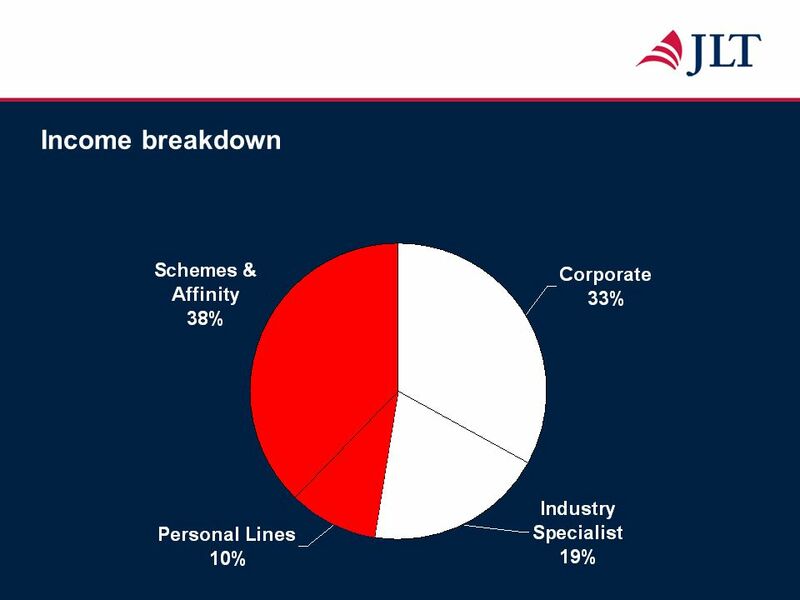 115 Income breakdown Personal Lines is the final part of our Non Advisory sector and is represented throughout Europe. 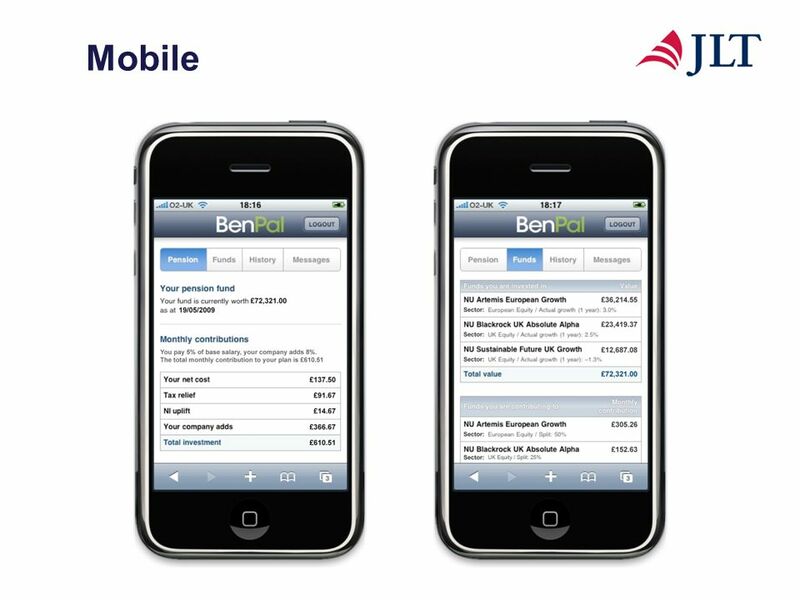 This will include Household and Motor along with specific products such as motor cycle, pedal cycle or musical instruments insurance. 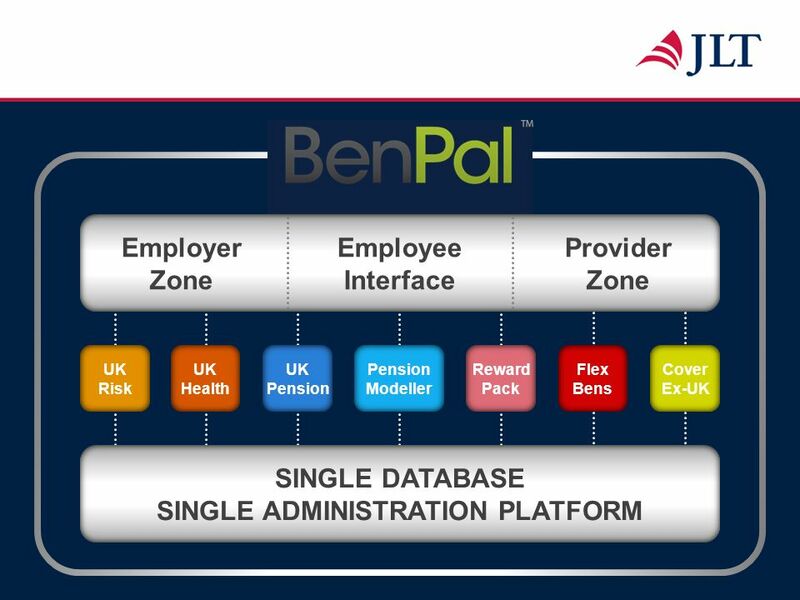 Distribution is both traditional and online, this being where our Online business sits. 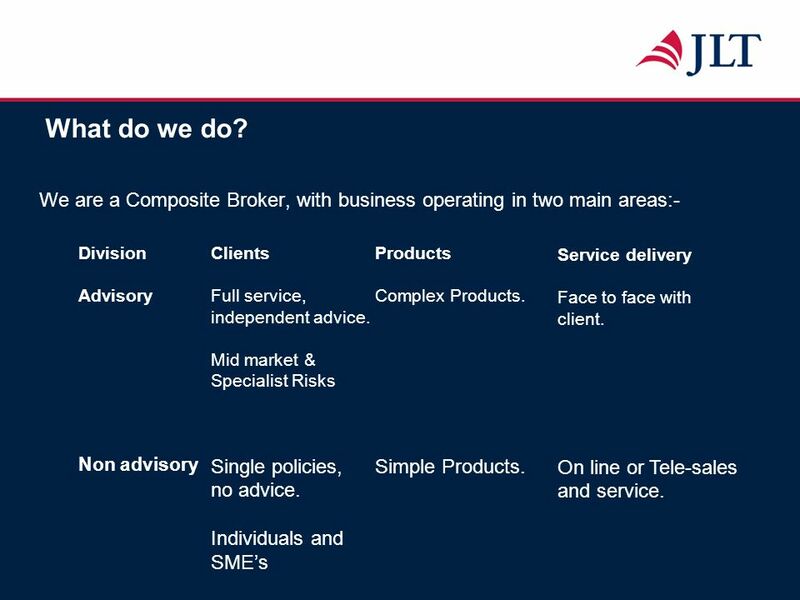 Again we offer quality, competitive products and our earnings are on a brokerage basis. 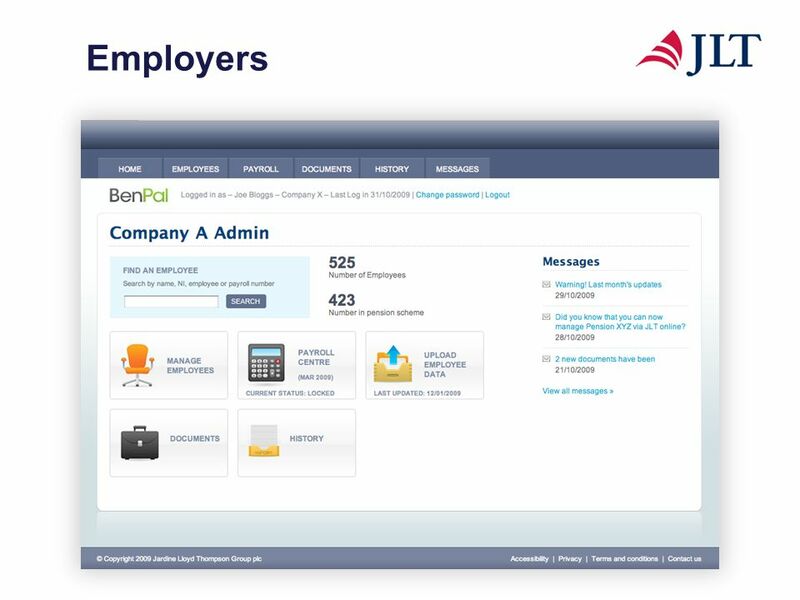 I will talk more about our Online business shortly. What have we done? 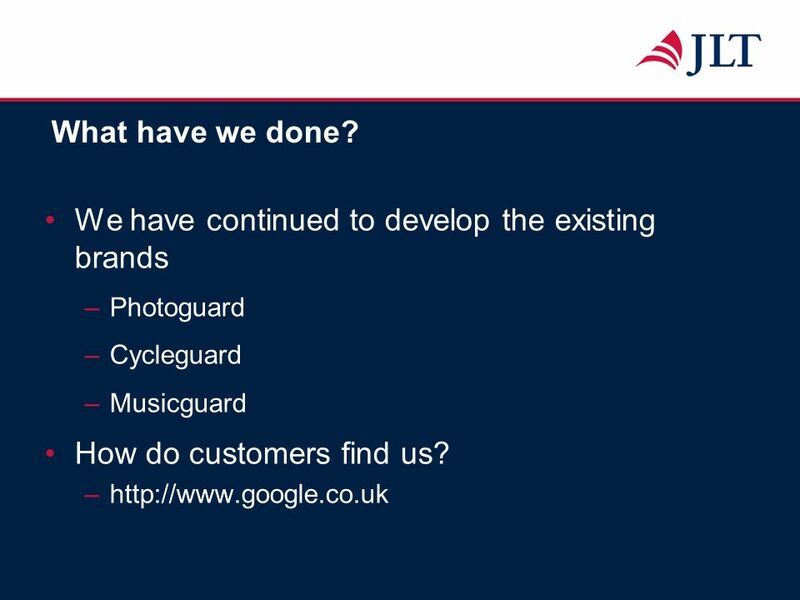 We have continued to develop the existing brands Photoguard Cycleguard Musicguard How do customers find us? 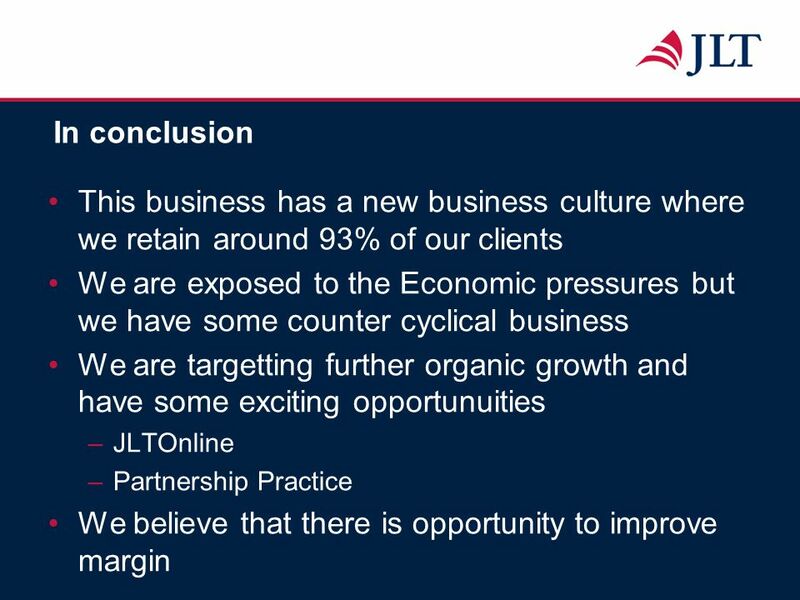 In conclusion This business has a new business culture where we retain around 93% of our clients We are exposed to the Economic pressures but we have some counter cyclical business We are targetting further organic growth and have some exciting opportunuities JLTOnline Partnership Practice We believe that there is opportunity to improve margin Thank you for your time. 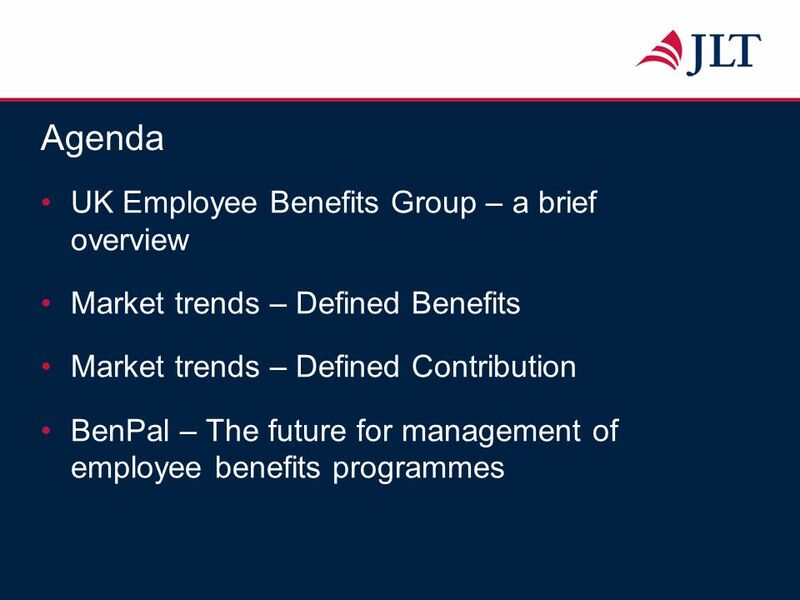 Pensions has become a boardroom issue with deficit and liability management and reduction key issues. 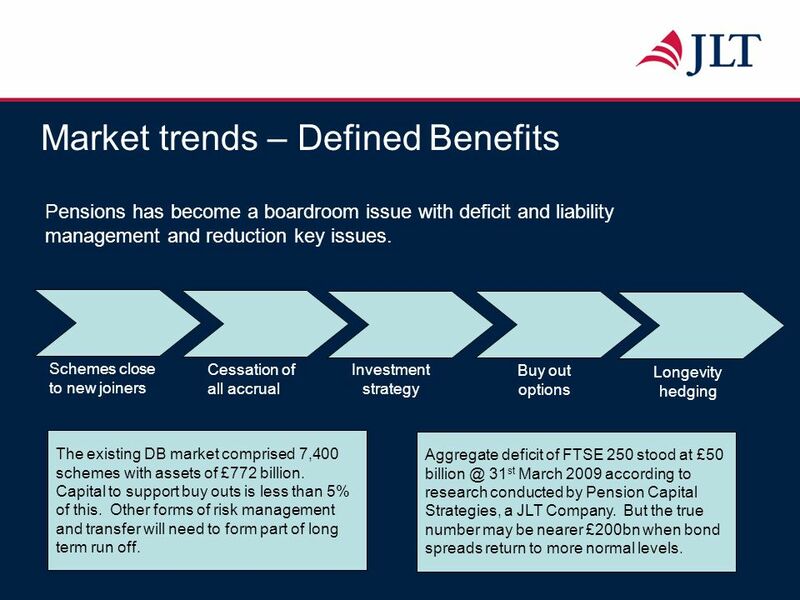 Schemes close to new joiners Cessation of all accrual Investment strategy Buy out options Longevity hedging The existing DB market comprised 7,400 schemes with assets of £772 billion. 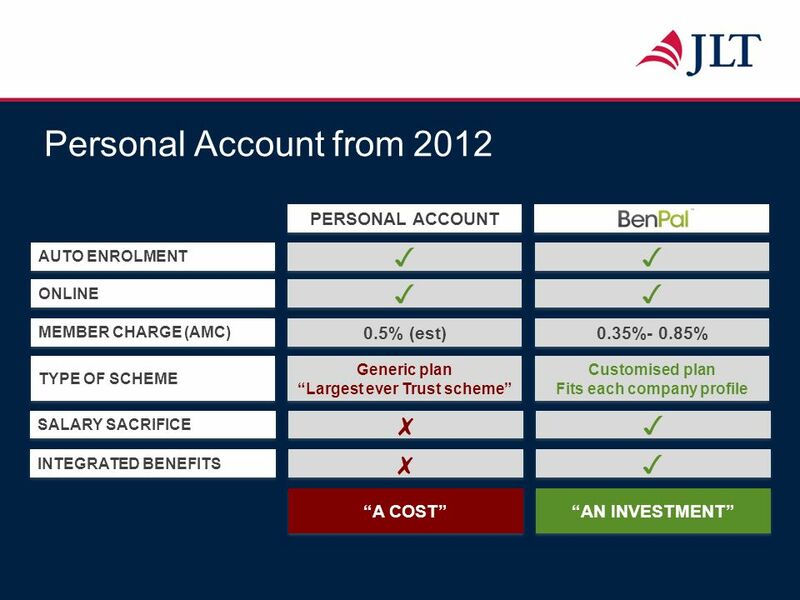 Capital to support buy outs is less than 5% of this. 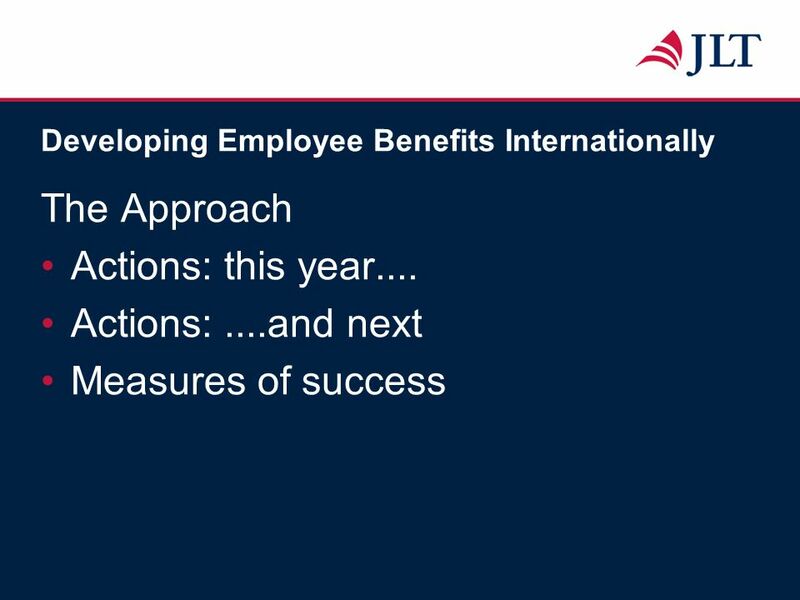 Other forms of risk management and transfer will need to form part of long term run off. 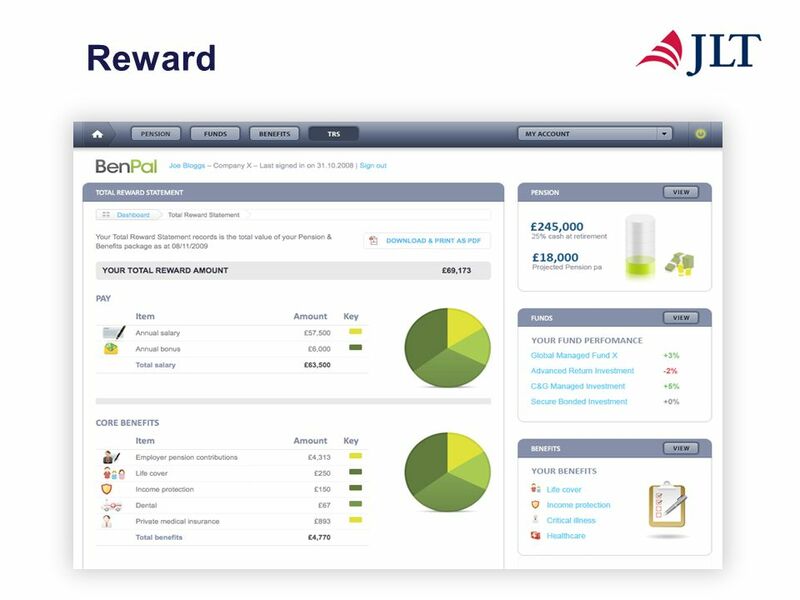 Aggregate deficit of FTSE 250 stood at £50 31st March 2009 according to research conducted by Pension Capital Strategies, a JLT Company. 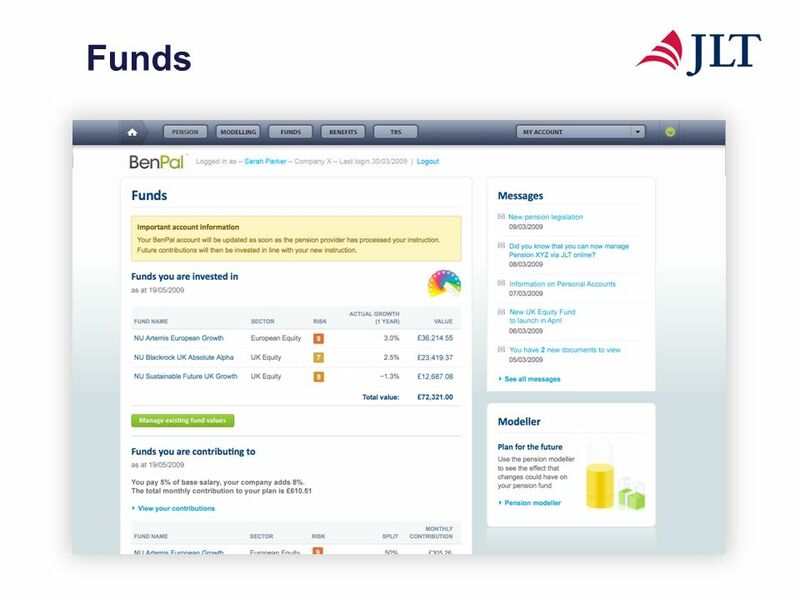 But the true number may be nearer £200bn when bond spreads return to more normal levels. 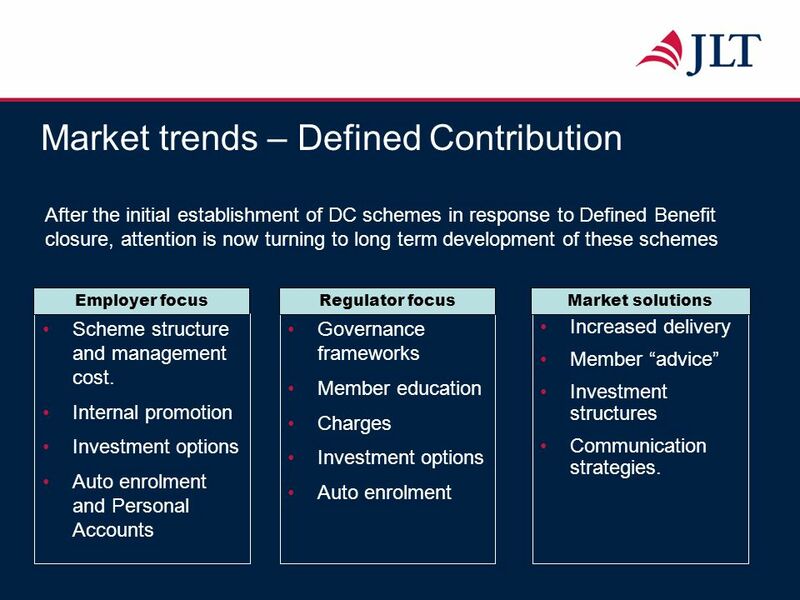 After the initial establishment of DC schemes in response to Defined Benefit closure, attention is now turning to long term development of these schemes Employer focus Regulator focus Market solutions Scheme structure and management cost. 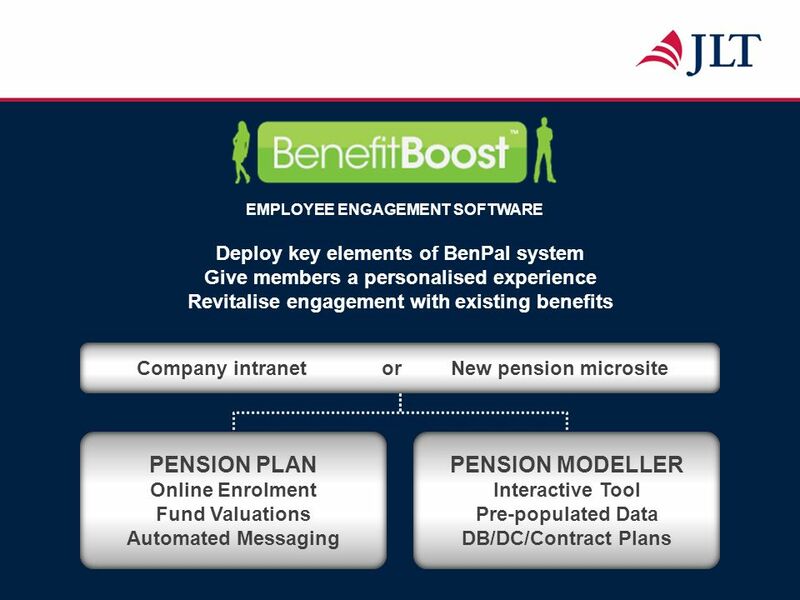 Internal promotion Investment options Auto enrolment and Personal Accounts Governance frameworks Member education Charges Investment options Auto enrolment Increased delivery Member “advice” Investment structures Communication strategies. 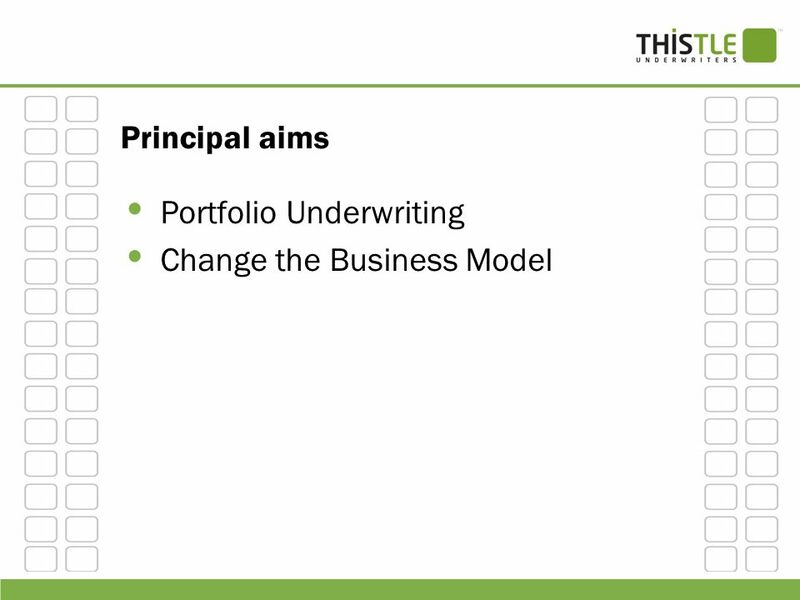 Schauer Group, Inc Risk Management & Insurance. 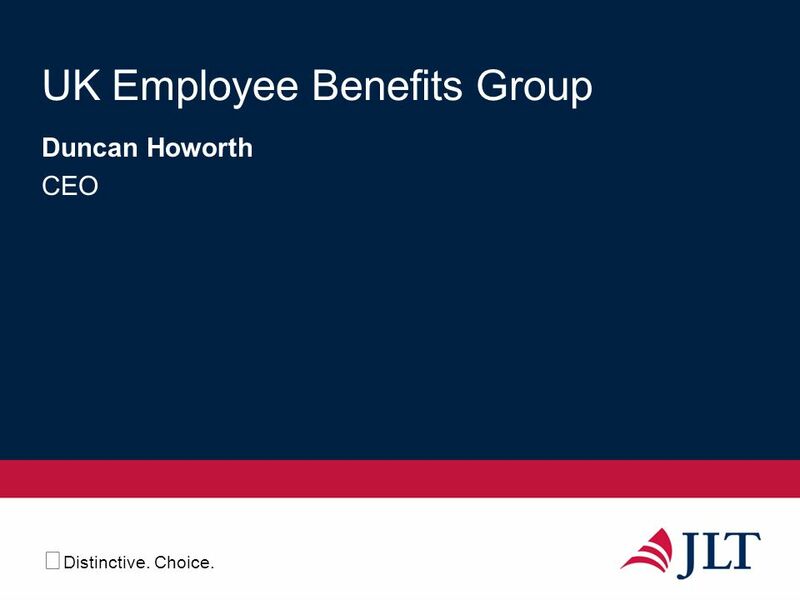 Presenters Joseph D. Schauer, CPCU, ARM Practice Leader Risk Management Ron Van Horn, CPCU Practice Leader. 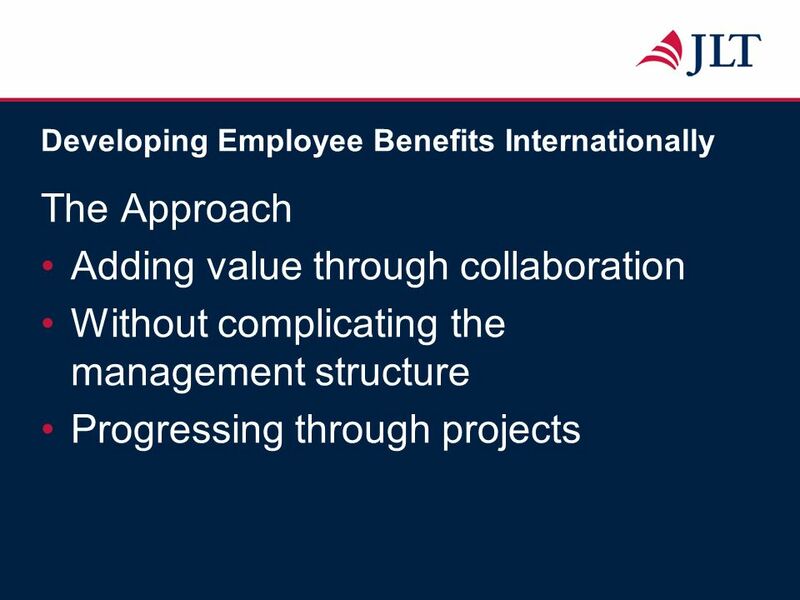 Aon Mission statement To be the leading provider of risk management services, insurance and reinsurance brokerage and a global leader in human resource. GEONG International Limited Wade Wang, CEO Amit Thakar, CFO March 2012, Beijing. 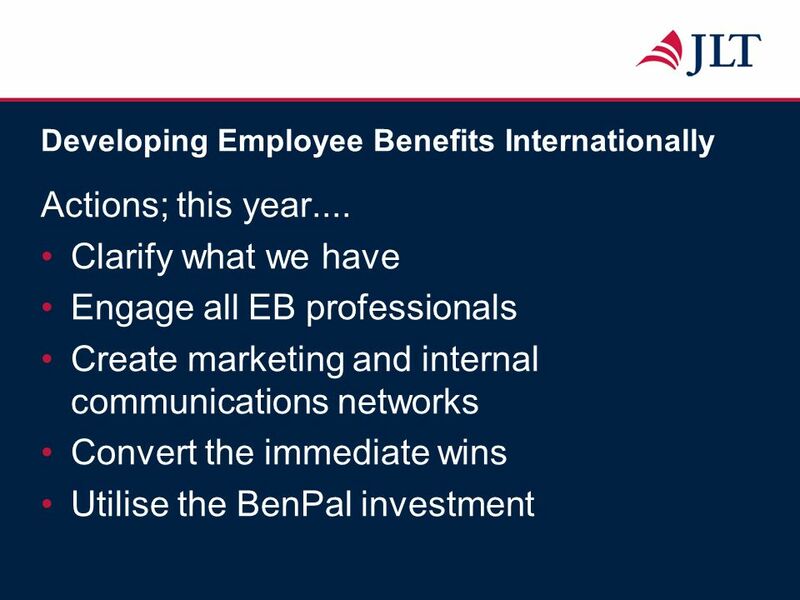 UWSEM Investment Guidelines and Strategy Frameworks for 2011-2018.